In recent years, we’ve seen more and more buildings appearing with timber-clad facades. Whether its a magnificent architectural masterpiece or a smaller but perfectly formed family home, wooden cladding is a great way to add a stunning and unique effect to any building. As our understanding of how to produce and protect wood has grown, architects and homeowners have been able to work with wooden cladding to produce some great results. This impressive seven-story timber clad office block in Paris’ 13th arrondissement was actually a former rail embankment. The center of the building has been opened up to create balconies and to allow people to view another building behind it. This concrete building is clad with timber to create a smooth effect on one side and sharp edges on the other. The large panels of glass in the center of the building give it a spacious, airy feel. Infill housing can often feel harsh and claustrophobic. Timber cladding was used on this infill in south London to ‘soften the impact’ of this three-story block of flats and two-story semi-detached houses, which were built on an old builder’s yard beside brick council flats. The use of timber cladding on buildings can create a wide range of effects, depending on how it is used. This Austrian timber-clad house is a great example of how wooden cladding can be used to create a stunning design. The house consists of dark timber cladding on the outside and light timber on the inside, to create what we think is a timber-clad masterpiece. For an opaque finish, Solid Color Stain can be used to protect and enhance wooden cladding. And as it comes in a wide variety of different shades, you’ll be able to choose a color that fits with your vision. The black-stained cladding on this visitor center looks stunning against the backdrop of the park and lake. The pale internal cladding contrasts with the dark external cladding to create a stunning visual effect. Arguably, we’ve saved the best until last. 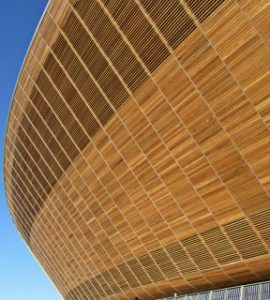 This 6,000 seat International Velodrome, built for London 2012, is one of the most impressive wood clad buildings in the world. Clad in 5,000 m² of custom-cut Western Red Cedar shiplap boards, this unique structure was built to emulate the mechanical efficiency and lightness of a bicycle. 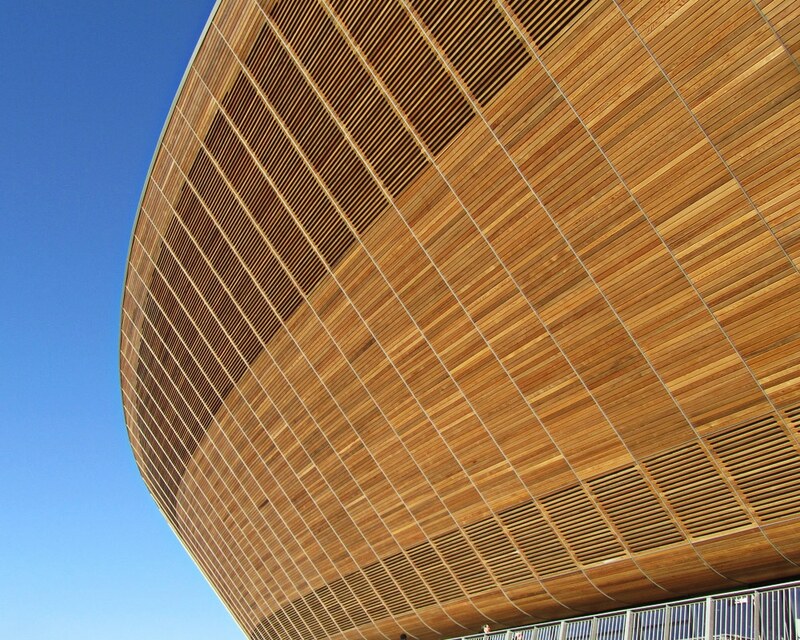 More than 1,600 litres of Textrol Oil Clear were applied to the velodrome to protect it against moisture and UV damage and to emphasize the beauty of the natural wood. Wooden cladding is used throughout the world to create an impressive effect on buildings of all shapes and sizes. By using the right products to protect and enhance, the beauty of wooden cladding can last for many years into the future. Want to know more about how to protect your wooden cladding? Known as the ‘professional’s choice’, Owatrol USA produces a wide range of high quality coatings which offer superior finish and exceptional protection. Get in touch today to find out more.